This week’s blog is posted the day before we will ordain six new priests for the Archdiocese of Boston. Presbyteral ordinations are always wonderful occasions. 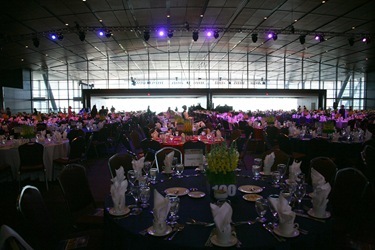 If you are reading this blog in the Boston area, I encourage you to attend. 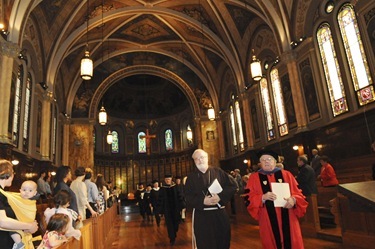 The Mass of Ordination will take place at 9 a.m. at the Cathedral of the Holy Cross in Boston. I look forward to sharing the details of the ceremony with you on next week’s post. 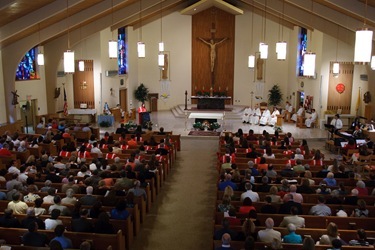 Last Thursday, we celebrated Mass with the consecrated virgins in the archdiocese. The Mass was offered for Jane Claire Forte, a consecrated virgin who passed away recently. 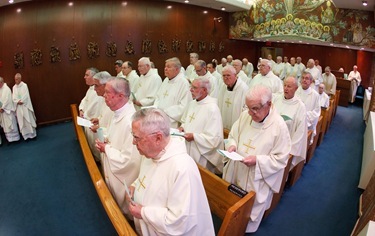 Boston has one of the larger groups of consecrated virgins in the United States. This ancient order in the Church was restored after the Second Vatican Council and sought women who consecrate themselves in celibacy to a deeper life of prayer and service in the Church. Certainly, in today’s world, the witness of the consecrated virgins is more needed than ever. We are very grateful for the women who have come forward and discerned this specific vocation in their lives. Sister Marian Batho, our delegate for consecrated life in the archdiocese, has been very good at helping us to prepare women for this vocation. On Thursday evening we celebrated a Mass marking the 50th anniversary of the presbyteral ordination of the class of 1959. 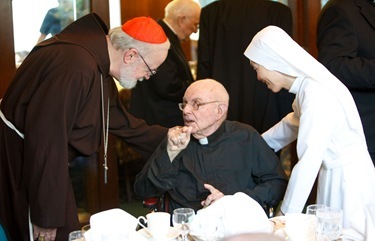 The Mass took place at Regina Cleri, the archdiocesan residence for senior priests in Boston. 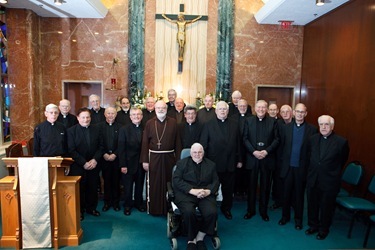 In attendance were 33 priests and, as always, it was a very joyful occasion. Msgr. 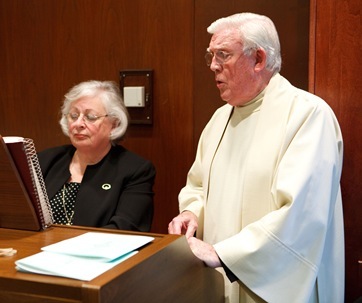 Frank Strahan, pastor of St. Bridget’s Parish in Framingham, who was also celebrating his 50th anniversary as a priest, was on hand to lead us in the music program. For him this was not a onetime appearance, since he actually comes every year to sing at this Mass. I thanked the priests for their many years of service and for their response to the call. I asked them to pray for our upcoming ordination class and for our priests as we embark on the upcoming “Year for the Priest” that will begin next month. 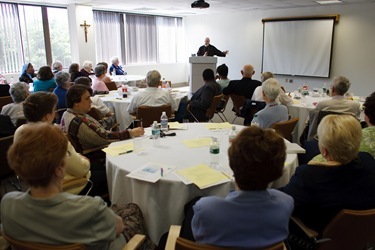 Friday, we had a meeting at the Pastoral Center with the pastoral associates. 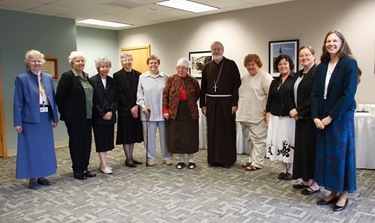 A number of them shared their experiences and various aspects of their ministries in the parish. It was a very moving testimony. At the gathering, we gave a farewell gift to Sister Dorothea Masuret, CSJ, who is winding down after many years of service in this program. Saturday, I went to the Redemptoris Mater Archdiocesan Missionary House of Formation for the installation of two seminarians receiving the ministry of Acolyte—Steven Clemence and Felipe Gonzalez. It is always a joy to see young men willing to prepare themselves to serve the people of God as priests. Also on Saturday was the celebration of Chorbishop Joseph Lahoud’s 50th anniversary. He is the pastor of Our Lady of Cedars, the oldest Maronite Community in the United States which is located in Jamaica Plain. Boston’s Archbishop John Williams established that community around the year 1890. The Maronite Community is mostly Lebanese of origin, although there are some parishioners from Syria and Palestine as well. 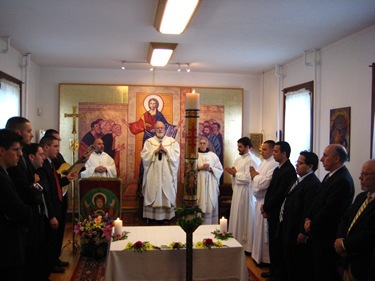 There are two Maronite dioceses in the United States—the Eparchy of St. Maron in Brooklyn and the Eparchy of Our Lady of Lebanon in Los Angeles. Bishop Gregory Mansour, the Bishop of St. Maron, attended the celebration and was accompanied by his Vicar General, Msgr. Michael Thomas, who is from New Bedford. I know his family very well and his brother, is a doctor who works for the Caritas Christi hospital system. Remain in peace, O Altar of God. May the offering that I have taken from you be for the remission of my debts and the pardon of my sins and may it obtain for me that I may stand before the tribunal of Christ without condemnation and without confusion. I do not know if I will have the opportunity to return and offer another sacrifice upon you. Protect me, O Lord, and preserve your holy Church as the way to truth and salvation. Amen. 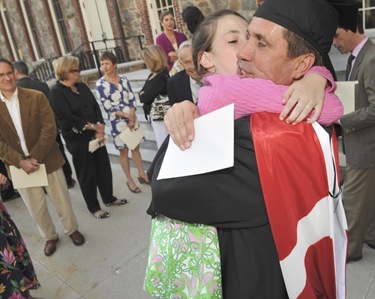 That night was Confirmation at St. George’s in Framingham. Both Father John Rowan, the pastor, and Father Ben LeTran, the associate pastor, are doing very well. Last year, St. George’s brought a number of young people to World Youth Day in Sydney and it was nice to see some of them there for their confirmations. 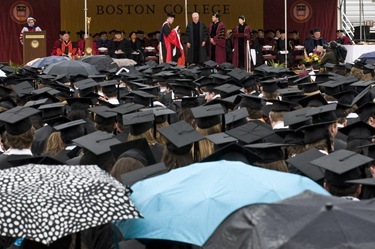 Monday was Boston College’s commencement ceremony. Every year they invite me to do the Benediction at the end of the service. 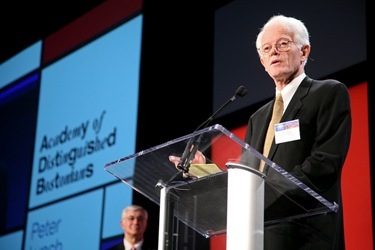 A number of very outstanding philanthropic Catholics were awarded honorary degrees, including Margot Connell (a philanthropist and supporter of Catholic education), Joseph Corcoran (a real estate developer and pioneer of mixed-income housing), Father Daniel Harrington (of the Weston Jesuit Community, an acclaimed Biblical scholar and author), Carolyn Lynch (volunteer leader and noted philanthropist), and Benaree Pratt Wiley (advocate of leadership roles for people of color in the business community). 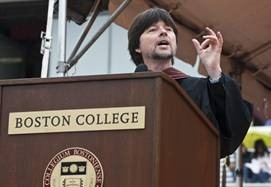 Ken Burns, a renowned historian and filmmaker, gave the keynote address. 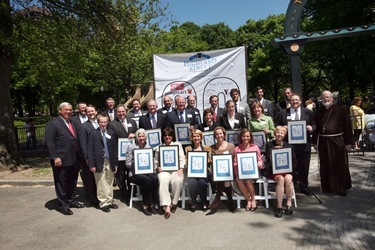 This past Tuesday I attended a special event on the Tadpole Playground on the Boston Common. This playground was created in 2002 by the Highland Street Foundation in loving memory of David McGrath. It was an appropriate place to celebrate twenty years of the McGrath family providing grants for community groups, through their Highland Street Foundation. On Tuesday the McGrath’s awarded twenty nonprofit groups a $100,000 grant , to assist them in the important work of meeting the needs of children, families, seniors and the homeless. Also, the Foundation announced that it is sponsoring Ten Free Fridays, a program that allows Boston residents to visit a local museum and other attractions for free on each of ten Fridays this summer. 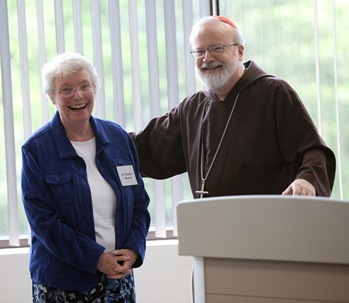 JoAnn McGrath and her family have been, and continue to be, very generous to the many Archdiocese’s many agencies, programs and services. I am grateful for the support and friendship of JoAnn and her family. We were very happy to be a part of that celebration. The mayor, lieutenant governor and I were all there to accompany the McGrath family. It was a beautiful day and there were many children in attendance from the various recipient organizations. Organizers were giving out cotton candy, popcorn and balloons—the kids had a wonderful time. 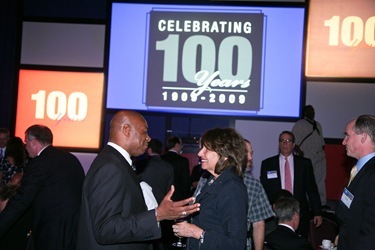 On Tuesday evening at the Convention Center, there was a banquet with 1,500 people celebrating the 100th anniversary of the Boston Chamber of Commerce, which has had so many civic achievements on behalf of the community. 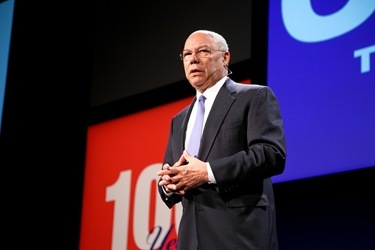 The keynote speaker was Colin Powell, who gave a wonderful talk. 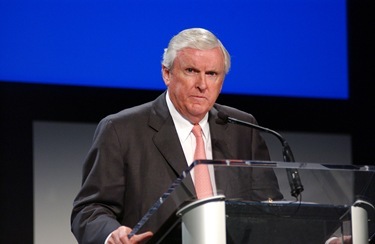 They honored a number of Bostonians, including Peter Lynch and Jack Connors. 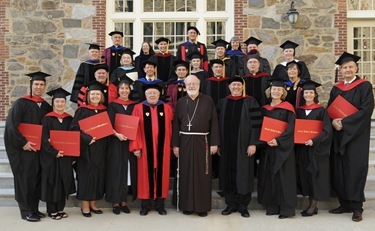 Wednesday, I attended the Master of Arts in Ministry graduation at St. John’s Seminary. 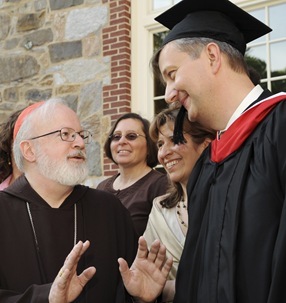 As I told the graduates, there are now over 30,000 lay ministers staffing our parishes throughout the United States, plus many thousands more involved in other ministries of education and health care. In the future, we know that this number is going to grow and therefore programs like MAM are very important. I read to them from the bishops’ letter — "Co-Workers in the Vineyard of the Lord’ — the description of the characteristics that we want to discern in people who are lay ministers. 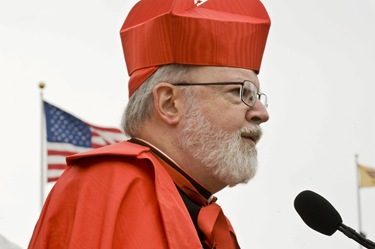 Among them are: their love for the Church, their own interior spiritual life, their frequent reception of the sacraments and their fidelity to the magisterium. The program helps people to deepen their spiritual life and their relationship with the Lord, better preparing them to serve God’s people. It is more than just a corpus of knowledge that is communicated; it is more than just some initials after their name. 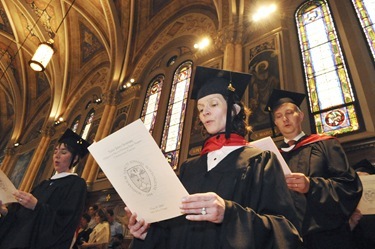 The Master of Arts in Ministry is truly a program of deep formation—spiritual, psychological, theological and human— to prepare them for their mission of service. 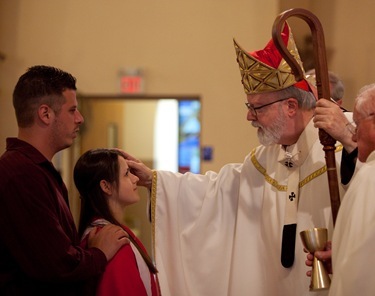 At this time of year, when we bishops are confirming up a storm, our ardent desire is that these young people who will receive the Sacrament of Confirmation will respond to the graces and live out that commitment. 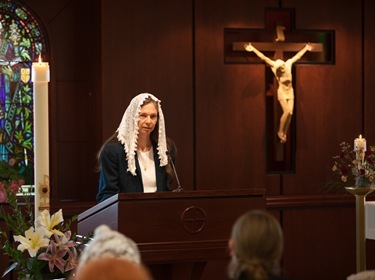 That is certainly what the graduates of MAM are doing, thanks to the direction and guidance of the people who work in the program—Father Arthur Kennedy, Aldona Lingertat, Angela and David Franks and all of the other professors and staff.